To purchase existing work seen on the website or at an art festival, contact me for availability. I am doing 15 to 20 art festivals a year and a particular piece may no longer be available. All of my jewelry and sculptural pieces, except for earrings, are numbered or named one-of-a-kind pieces. However, I work in series and will be happy to make a piece for you that is similar to but different from one you may have seen. You can view images of my work that has been collected over the years in the History section of the website. The most important factor in purchasing work from a web site is to be sure that you like the style of work of the artist. That would be me and we should talk...either in person or by phone or e-mail, about the work you are interested in acquiring. Please call me! I will be happy to stop what I am doing to talk with you. 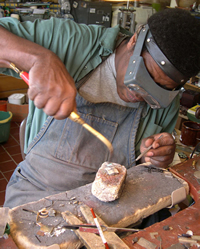 Commissioning a piece of jewelry or sculpture should not be an intimidating process, either. A commissioned piece makes a very personal, unforgetable gift for yourself or for someone else that is ideal for any occassion. We would talk together about your ideas and feelings concerning the piece you would like to acquire and I would work through some ideas on paper that we would then discuss before moving further. Once we have decided to proceed, we will determine the time frame and cost. Payment: We will send an invoice by e-mail from Square and you can use their secure online portal for payment. We will ship the work to you as soon as possible, along with a tracking number. Satisfaction is guaranteed, with a full refund except for shipping costs, if the item is returned to me intact within seven days of receipt. Prices and availability subject to change without notice. 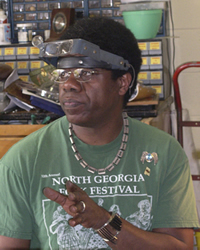 The contents of this website copyright © 2002-present by Charles Norman Pinckney of Charles Pinckney Designs, Athens, GA. All Rights Reserved. This page was updated May 28, 2018.